In 2009, Bord na Móna created an exhibition to celebrate the company’s 75 years in operation, and our rich history in Ireland’s midlands. 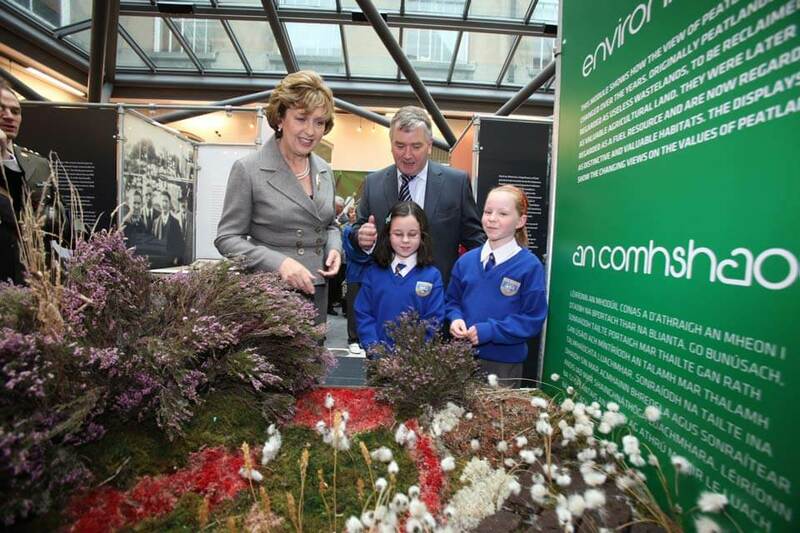 In 2009 Bord na Móna created the Heartland exhibition to celebrate the company’s 75 years in operation. The exhibition was welcomed to a number of locations around the country - often where it would be most at home - near the towns Bord na Móna has become part of, near the workers past and present, and of course close to the bogs, its very foundation. The exhibition was broken into 7 themes or sections. Each theme contained artefacts, pictures and stories from the previous 75 years of Bord na Móna’s history. Each location saw a large number of visitors, both those who had come to learn and those who wished only to reminisce. On every occasion, the visitors and also the exhibitors were lucky to take something positive from the exhibition. The exhibition was launched in September 2009 at the Office of Public Works, Dublin. The launch was attended by members of the Bord na Móna board, Ryan Tubridy, and President Mary McAleese. The president said a few works on the day which can be seen below. This section highlighted the social impact of Bord na Móna on the communities of which it has been part for several decades. Through hostels and housing schemes the company has interacted with and integrated into the communities of the midlands. The displays show the sporting and social aspects of this integration. This section showed the impact of peatlands on Irish cultural life. Bog wood was used for Building purposes and now inspires objects of art. Numerous archaeological finds provide us with a unique insight into our past. The displays show some of the items inspired by peatlands and also items discovered in them. Discover the origins of the peat industry in Ireland. Peat had been used In a small way as a local fuel for centuries until eventually attempts were made to develop the bogs on an industrial scale. This module reflects the early thinking in this regard as well as the evolution of government policy. See how the view of peatlands has changed over the years. Originally peatlands were regarded as useless wastelands, to be reclaimed as valuable agricultural land. They were later regarded as a fuel resource and are now regarded as distinctive and valuable habitats. 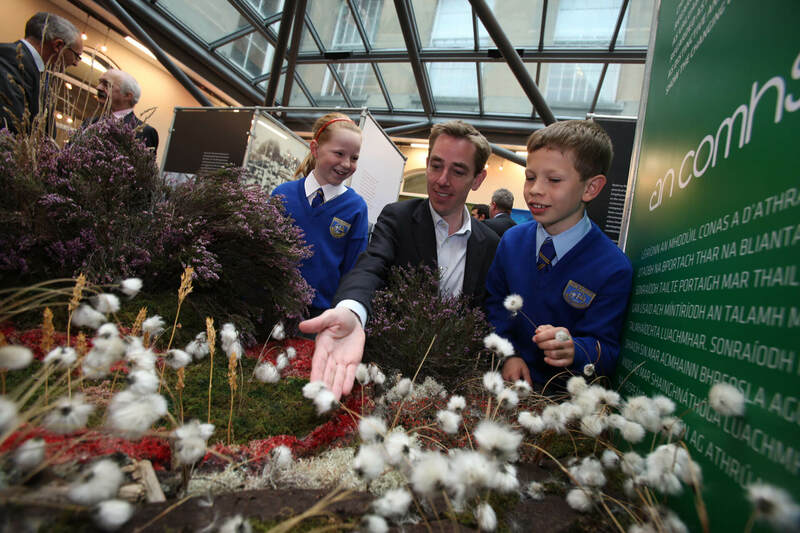 The displays show the changing views on the values of peatlands. Having large machinery that could work effectively on the bog required continuous innovation from Bord na Móna over the years. Early machines had to be adapted to Irish conditions, improvements made to reduce costs, and new products developed to expand the industry. The displays show the development of improved and new products. This section focused on the change in work practices as the industry developed. In the early days most peat was cut by hand but hand-cut peat was inferior to machine cut peat. The need to provide an economical and high quality fuel, led to improvements in machines and processes. Bord na Móna today is much more than a peat company and has progressively and successfully moved into new business areas over the last number of years. The vision for the future of the company – a new contract with nature – sets the context for the next phase of development which will be based on sustainable activities. This module outlines the plans in place to deliver on this vision. Bord na Móna has many uses for it's land. Learn about what our land is used for today.